Italy, 1970s A fabulous example of the Saporiti Italia aesthetic of the 1970s, this low coffee table comprises a square glass top, with rounded edges, that is permanently fixed (with invisible adhesive) to four stainless steel–topped wooden arcs. USA, 1950s This elegant console table features four drawers and a shelf below. The narrow width and counter height is perfect for an entryway. USA, 1950s This mahogany coffee table by T.H. Robsjohn-Gibbings for Widdicomb features a rounded square top, a lower shelf, and sweeping saber-shaped legs. 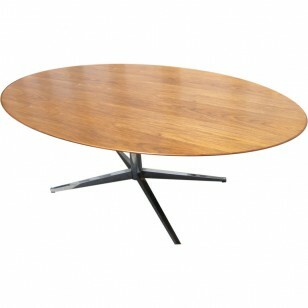 Denmark, 1960s This rosewood dining table by Kofod Larsen is impressive and versatile. 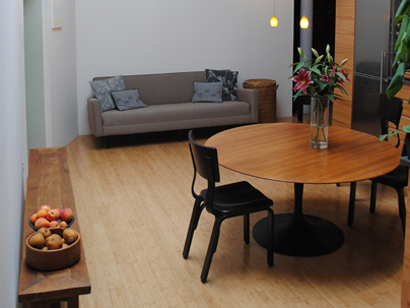 The table includes three large leaves that each measure 23.63″, allowing the table to extend to 120″. An extra leg drops down to provide additional support. USA, 1950s This iconic slat bench by George Nelson for Herman Miller can serve as either seating or as a coffee table. Norway, 1960s This set includes a large wall mirror and a low console table with three drawers. Both items are constructed of rosewood and feature arc-shaped cutouts. The mirror measures 28.75 ” W x 48″ H x 4.75″ D.
USA, 1970s This 1966 Collection coffee table has a vibrant yellow porcelain enamel top, a color which is no longer in production. Australia, 1940s This classic art deco side table by NAMCO in the style of Warren MacArthur is constructed of aluminum tubing in MacArthur’s patented technique. It features the original walnut veneer top that has been expertly refinished. 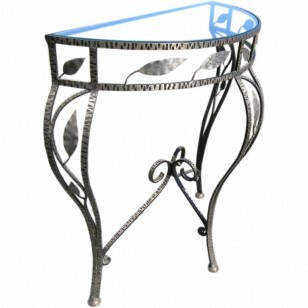 Australia, 1940s This classic art deco side table by NAMCO in the style of Warren MacArthur is constructed of aluminum tubing in McArthur’s patented technique. The frame is in original condition, and it features a brand new walnut veneer top. USA, 1950s This pedestal table by Edward Wormley for Dunbar would serve equally well for breakfast, tea, or games. A round top of beautiful green Portuguese marble sits on a mahogany trefoil column on a brass-rimmed leather stand. Italy, 1970s This sleek Italian console table from the 1970s pairs a chrome and brass base with an inset glass top. It can equally serve as a sofa table. 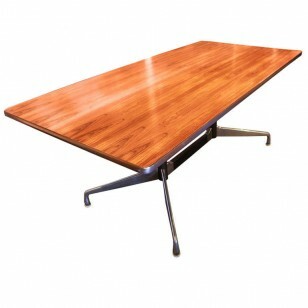 USA, 1950′s This walnut dining table has been expertly refinished to highlight its stunning grain. It features two additional leaves that measure 18″ each and a fifth leg for additional support in the center when the table is fully extended. USA, 1970′s This versatile table has a beautiful sculptural base accented with chrome connectors. It speaks for itself. USA, 1960′s Great vintage example of this classic Eames design. USA, 1950′s This beautiful drop-leaf table by Swedish-born Greta Grossman is versatile and elegant. When leaves are down the table measures 60″L x 18″D x 29″H. USA, 1970s This beautiful walnut table has been expertly refinished. Canada, 1950′s Elegant console table perfect for a front hallway. Dimensions of glass top are 26.25″ W x 11″. USA, 1970s This beautiful table features a magnificent elm burl grain. With a warm glowing tone, this table will make a statement in any room. Two 18″ leaves extend the length from 60″ to 96″. USA, 1960′s This versatile rectangular table by Charles Eames has a beautiful rare rosewood veneer top. 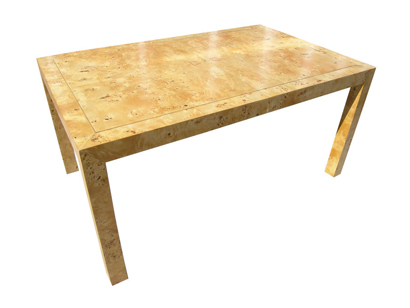 It can be used as a dining table or conference table or desk. 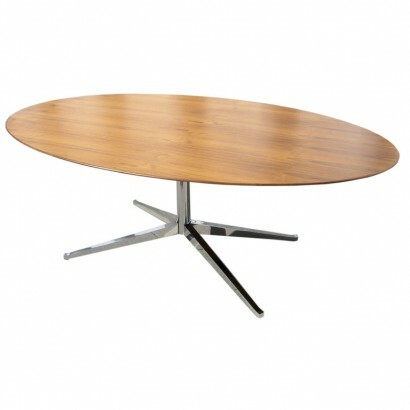 USA, 1970s This elegant table can serve as a dining table, conference table, or desk. With a beautiful walnut top and chrome base. 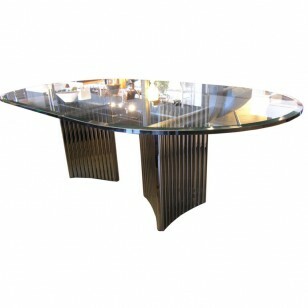 USA, 1970′s This beautiful table features two slatted chrome bases with a 5/8″ thick glass racetrack top with a beveled edge. Danish, 1950′s This rare coffee table by Johannes Andersen has a unique sculptural shape with a useful lower shelf.